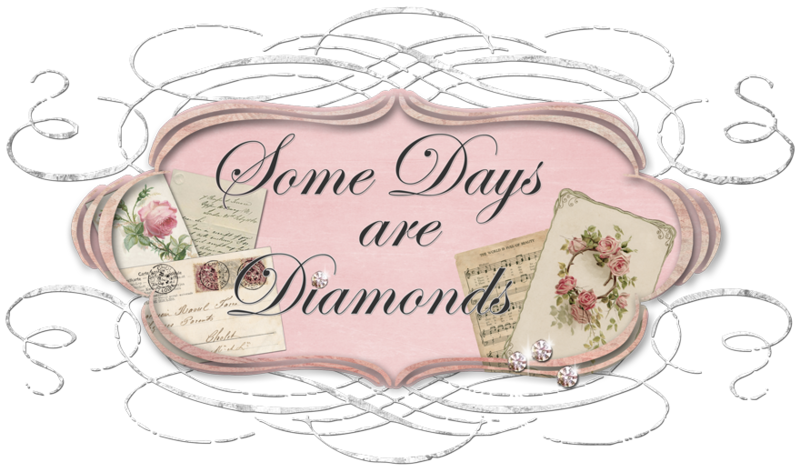 Some Days Are Diamonds: Just Too Flippin' Cute! My mailman hates loves me once again! (hehehe) Opened the mailbox last night to a cute little box. You see - I won the cute little pink polka dot pumpkins from Dolly at From My Cherry Heart. Have you ever seen such adorable pumpkins? And she sent the sweetest little note with them. Oh my goodness, I just LOVE them!!! They are so tiny which makes them sooooooo sweet. I placed one on my little crystal and saucer dish I made . . .
Can you see the sweet polka dots? Oh my gosh - just wasaaaayyyyyyy too cute! I don't think these are going to get packed away in my Autumn decor. I think these justify a year-round kind of love! And I'll think of Dolly every time. Cutest little pumpkin and I do see the polka dots! I think that I am going to come and hide in your bushes and ambush the mailman:) The gifts just keep on comin out there! Love to all and those pumpkins are just too precious!!!!!! Hey, check my Sister's blog tomorrow, she is posting the cake ball recipe! Those little pumpkins are just too cute. Your mailman really DOES love you. I would leave them out all year long too. They are way cute. I am so happy you got them! Hope your having a good week! Those are really cute! I would love to have those for the cabin! Congratulations on your sweet win! Those little pumpkins are just adorable! They are adorable! You can use them all year round. Congratulations! You deserve to win! You're such a sweet blogger. Adorable!!! And I can't think of anyone sweeter to receive such a lovely gift! OMGoodness - What a super win!!!! Those are sweet! They really are so cute - what a wonderful thing to win! you are correct -- those are just too flippin' cute! what a cute idea. the gingham bow makes it! so many great ideas out here in blogland! Hi Karen, just wanted to say thanks for popping by my blog today, it is nice to "meet" you. So sad to read stories of people's hardships, you really have a huge heart. I absolutely loved the pumpkins. How cute are they? You must feel like Cinderella finding her magic pumpkin! Life's Twists and Turns . . .
Halloween fun . . . The Weekend . . . Welcome to Doors of Welcome! Is it December 25th already? One Week From Today . . . I don't think my mailman likes me anymore . . .
Finishing My Journal . . . I love getting the mail!